Democrat Ammar Campa-Najjar has become the darling of the mainstream media in recent weeks — most recently, drinking beer with Rolling Stone while boasting that he once secretly recorded President Donald Trump. But there is much about Campa-Najjar that remains unknown — even after dozens of media “fact checks” aimed at ads by indicted incumbent Rep. Duncan Hunter (R-CA). Here are seven questions Campa-Najjar can’t — or won’t — answer. 1. Why did he change his name in the middle of the election? Campa-Najjar changed his name a week after the primary, from “Ammar Yasser Najjar” to “Ammar Joseph Campa-Najjar,” adding his Mexican-American mother’s maiden name (“Campa”) to his Palestinian father’s surname (“Najjar”). Campa-Najjar says he had already used his new surname for years, but he dropped that name from his campaign committee, calling himself “Ammar Campa.” His campaign’s website also omits “Najjar.” Why now? 2. Why did he call his terrorist grandfather a “legend”? One reason Campa-Najjar may have wanted to obscure his surname was that his grandfather, Muhammad Yousef al-Najjar, was a Palestinian terrorist involved in the massacre of 11 Israeli athletes at the 1972 Olympic Games in Munich, Germany. When that surfaced earlier this year, he condemned his grandfather’s actions and said he supported peace. Yet three years ago, he called his grandfather a “legend” and a “public servant.” What, if anything, had Campa-Najjar ever done to promote Israeli-Palestinian peace before it became politically convenient to do so? 3. What are his actual policies on the Israeli-Palestinian conflict? Campa-Najjar has said little about what he actually believes — except to criticize Israel’s “wall,” which has stopped suicide bombings and saved thousands of lives. Campa-Najjar was literally spoon-fed by Yasser Arafat’s wife; he describes his father, a former Palestinian official, as “estranged,” but clearly admires him. He has reportedly reported money among Palestinian-American donors as far afield as New Jersey. Most of his other policies are far-left. Would he actually defend Israel’s security? Or would he use the vote of the 50th congressional district to join Democrats’ extremist new anti-Israel delegation? 4. Why won’t he return a Palestinian ambassador’s donation? Breitbart News uncovered the fact that Campa-Najjar received a $250.00 donation from a Palestinian ambassador in 2017. Democrats have accused President Donald Trump of “collusion” with Russia merely because his son met a Russian, but here a Palestinian diplomat actually gave a Democratic candidate money. He has raised millions of dollars; why won’t he return that donation? And how did he obtain that donation in the first place? What are his connections, if any, to Palestinian leadership? 5. Why does he take donations from CAIR leaders? 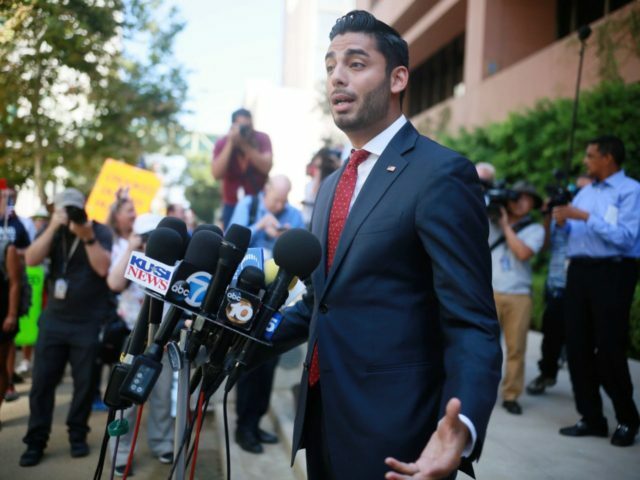 The Campa-Najjar campaign has taken $17,300 from board members of the Council on American-Islamic Relations (CAIR),* a radical group with a controversial history in Southern California that includes helping the family of the San Bernardino terrorists. He refuses to return the cash. 6. Why did he give money to CAIR? The Campa-Najjar campaign gave $650.00 to CAIR last year, a “civic donation” that, his campaign told the San Diego Union-Tribune, was “for 10 people — all of whom happened to identify their faith as Catholic or Christian — to attend a banquet to learn about CAIR’s work.” Why would a candidate — particularly a Christian one — want ten random people to learn more about CAIR’s radical agenda? Does he agree with CAIR’s positions — such as blaming American foreign policy for the San Bernardino attack? 7. What kind of security clearance did he have at the White House? Campa-Najjar has defended himself against claims that he would be a “security risk” by arguing that he passed an FBI background check to work at the Obama White House. But he was simply an intern there who handled the mail. He told Rolling Stone he had secretly taped Trump — is that how someone with clearance would behave? His spokesman recently said Campa-Najjar passed an FBI check to work at the U.S. Department of Labor — but did not mention the White House. What is the truth?